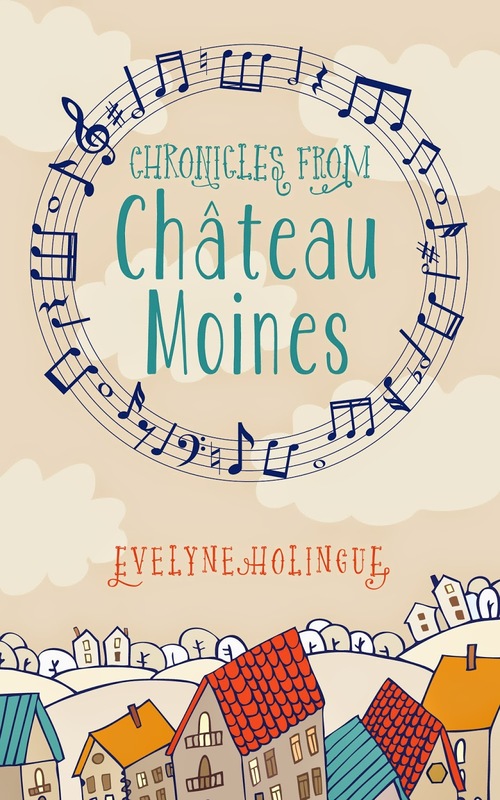 Welcome to my tour stop for Chronicles from Chateau Moines by Evelyne Holingue. This is a middle grade historical fiction. The tour runs March 2-13 with reviews, interviews, guest posts and excerpts. Check out the tour page. His faded bell-bottom Levi’s hug his hips, and a turquoise T-shirt matches his eyes. I’ve never been south of France, but Papa has sent me postcards. This boy’s eyes rival the color of the Mediterranean Sea. He doesn’t wear any socks with his Indian-style sandals. He’s got a perfectly worn-out army bag with buttons and badges. I recognize the peace sign and the names of big American cities, which make me feel small and ignorant. A pair of roller skates is tied to the straps of his bag. With his shaggy haircut, he belongs more in Mademoiselle magazine than in Chateau Moines middle school. I must have looked as stunned as Saint Bernadette when she saw the Virgin Mary in Lourdes, because Scott points at his chest. “Je suis Scott Sweet,” he says with the same exotic accent. Scott flashes a Paul Newman smile. “Juh mahpell Scott Sweet,” he repeats. Despite his smile, he looks confused, and I wonder how it feels to be the new kid at school and to be a foreigner. Annie turns to me and clasps her hands together. I don’t adore Annie at all right now, but I can’t blame her. She saw him first at the bakery. Then she found his name on the list. And she can speak some English. For some reason, I have the feeling that this first day of school marks the beginning of a lot of unpleasant firsts. I am trying to learn french!!! Oh m gee, this book will test me on my limited and basic knowledge about the language.